Western style pendant cast from sterling silver. Great for the female rider in your life. 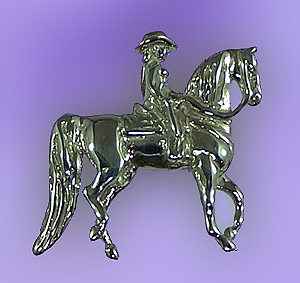 Two dimensional western pleasure pendant cast in sterling silver. Offering exceptional features complete with western outfit and female rider. Dimensions: 7/8 inches tall x 7/8 inches wide. Available in 14kt yellow gold, 14kt white gold, or stering silver.